The next day Dr. Bob covered normal delivery using a pelvic mannequin. Before we got some good lubricant I got to be the “mom” and push the baby out. I guess it wasn’t as hard as a real birth, but boy was it a struggle. BBecause the Tuareg and Wodaabe give birth in different positions we positioned the mannequin accordingly. Fatima, a Tuareg, is practicing in the side position. Alboukou, also a Tuareg is the most dynamic of the new students. We found out that she is a singer. 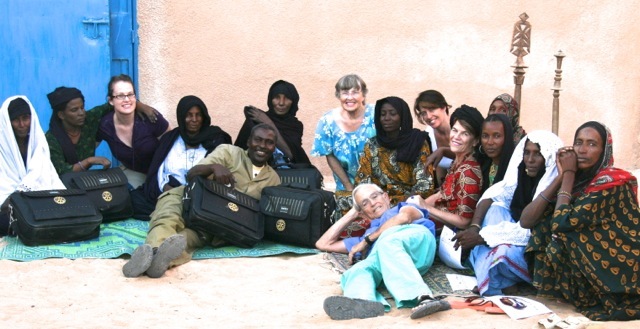 Tuareg women singers are central in their communities because they lead the parties. They make up songs about what is going on in their lives the community’s and sing the lines and then the other women and girls chant the response. I have always been told by the men to NEVER cross a Tuareg woman singer or EVERYONE will know about it at the next party. 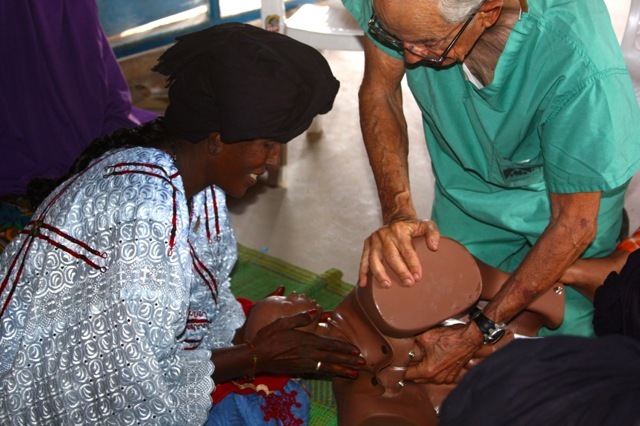 Because the Wodaabe give birth in a squatting position Dr. Bob duplicated that for Azarra to practice. 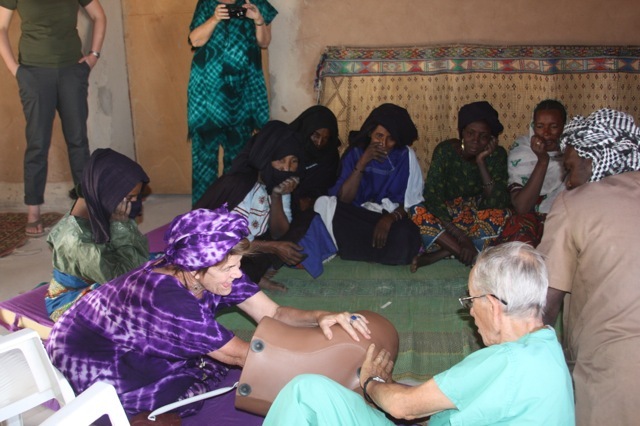 Since she is already an experienced matron she was showing the new Wodaabe student how. In the afternoon, after all the women had demonstrated they understood the normal delivery procedure–as this is a pretty experienced group they picked this up quickly. The next step was out of their realm of experience–taking blood pressure. Here Dr. Bob starts by explaining the pulse and how the heart pumps blood and why this is important. Then Sheri and Jennifer, our two volunteers jumped in and taught numbers. After two days of review they pretty much had it and could proceed to actual practice taking blood pressure. 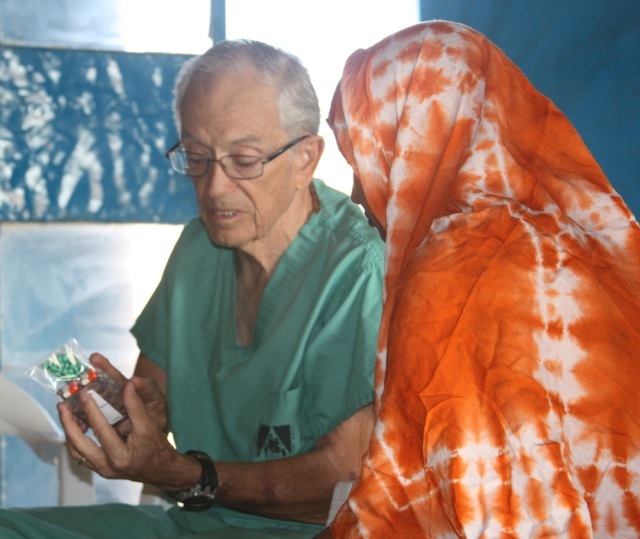 Dr. Bob and Ali went over the other complications and then started the final step–explaining the meds. After all the women had demonstrated that they understood the meds–this was a two day process, but Ali is pretty confident. We issued them their bags. A big thanks to Rotary Club and the Caster Family Foundation for making this program possible. a white man shouldn’t teach women how to give birth, that’s none of his business. Why are you interfering with their innate knowledge on how to give birth? It’s since men started to interfere with the birthing process that giving birth became difficult. All these women need is good nutrition and hygiene, nothing more. Your “knowledge” is inferior to every woman’s bodily intelligence. The body knows how to give birth, just like dr bob knows how to poop and doesn’t need instructions from someone else on how to do it including when to push. I totally agree with you that a white man should not interfere with women’s natural knowledge. In the two years before we started the program I personally knew 5 young women (aged 19-25) who died in childbirth leaving 5 orphans. They simply did not know about prenatal nutrition, hydration and hygiene. 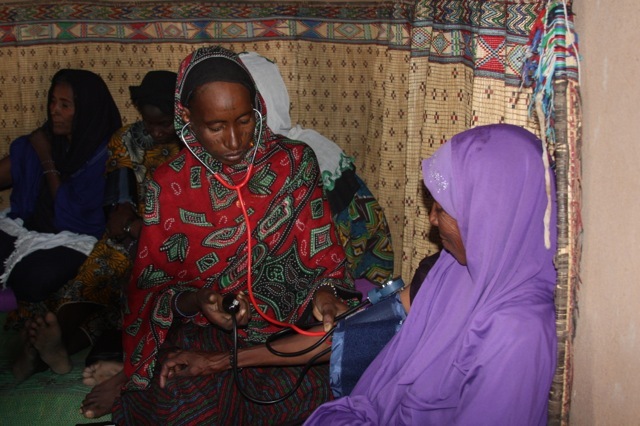 Since the program began, the trained women have counseled their communities and assisted at over 300 births and they have not lost one mother. This in a country where the national statistic is one in seven women have a lifetime risk of death in childbirth. These deaths are not caused by men, but by lack of knowledge. It is the women, chosen by their communities who have made this difference using knowledge that we have given them. I’m wondering, what are the meds for? My children we’re delivered by midwives in America and I never had to take meds. Also, are they been taught to change their religion in exchange for this medical knowledge. Nothing is free….. They must be asked to give up something in exchange. As you said you live in America so you likely do not have parasites, you likely have access to clean water and actually ANY water, you likely wash your hands occasionally at least, you likely have prenatal vitamins or if not at least somewhat adequate nutrition. These women die in childbirth mostly due to lack of knowledge of nutrition, hydration and hygiene. When meds are needed it is because of an infection or post-partum hemorrhage. Most of these problems we can solve with knowledge, but sometimes meds are used–rarely. No one has ever been asked to give up their religion–it is not spoken of. Of course this in not free–I fundraise for it, volunteer all my time and much of my money, our medical doctor volunteers all his time and much of his money and many generous donors pay for the participation of local staff, equipment and training programs. 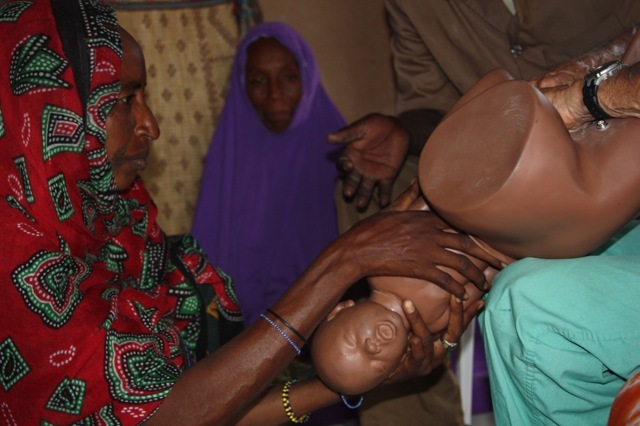 The originally trained midwives are now training new ones themselves. I am sorry you are so skeptical, but you need to understand that conditions in Saharan Africa are not like those in America. 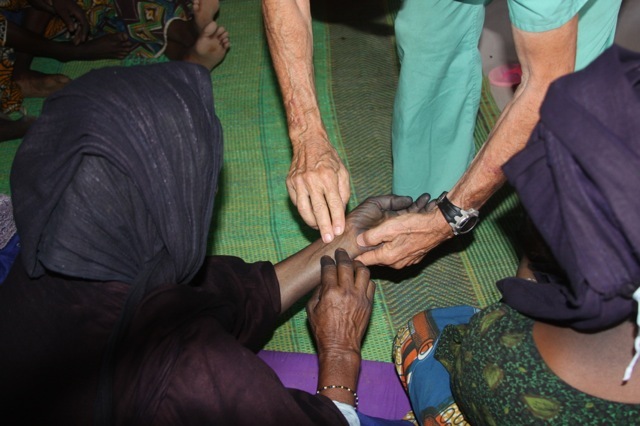 One of our trainees, when she went through the process of washing her hands with a scrub brush said–I did not know my hands were that color. This lack of hygiene can cause infection–thus the need for some meds–better to wash hands–so we provide soap and scrub brushes and KNOWLEDGE.